Candice's Beauty Blog! : Majorest HAUL ever! 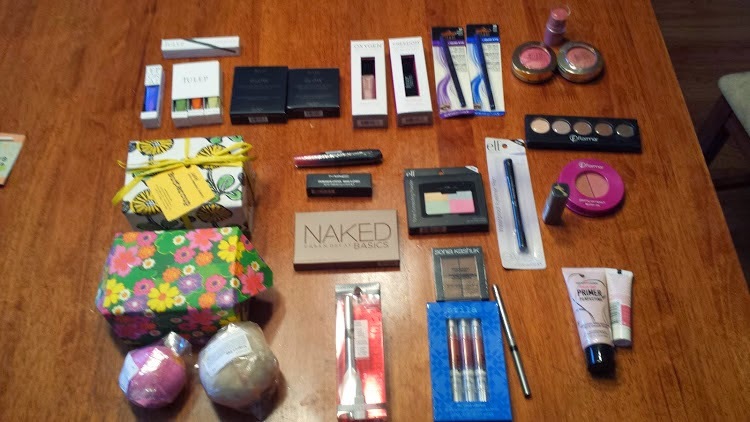 I've got stuff from a year-long swap with 11 other ladies... I've got a few things I purchased in the USA (Milani and Jordana top right), a couple things by Flormar which isn't available here that I picked up in Alexandria, Egypt and I've got my Julep April box with add on and secret store purchase (top left). I haven't tried everything, but I'm really enjoying my bath products by Lush... so fragrant and relaxing and beautiful and even exciting when it fizzles and stuff! Also, I tried the Julep Oxygen Nail Treatment and liked it, at least so far. I also put on Julep Kayla and it was sheerer than I was expecting. I had to use 3 coats which I hate doing... I ended up not having quite enough time for it to fully dry so it looked a bit "off" the next day and wasn't as great as I originally believed. The colour is amazing (even in my crappy picture, top left purple-blue colour) but it wasn't that good with my unevenly dried nails. The Julep blush and bronzer are incredibly powdery, it's difficult to get the right amount on the brush - must be VERY careful. They still seem like good products though and I found gave a nice glow. Urban Decay Naked Basics... Wow! I'm in love! The pigmentation is out of this world... the colours are not at all powdery and gross like some mattes can be. One shade is actually a bit shimmery surprised me but it fits perfectly! I really love this palette for the products and even packaging, how compact it is! Physician's Formula 2-in-1 lash boosting serum liner. I really like this a lot! I have no idea about the serum, but this is a long-lasting, super pigmented black, thin eyeliner! Hard Candy sheer envy primer... I tried a small amount on my hand when I got it - thought I probably got a bad batch or something. The stuff was PILLING on me!! But it seems that's just the way it is with the primer... Applied a bit more carefully a little at a time all over the face, it creates an even canvas for what's next to come and I'm actually LOVING this budget product. I totally recommend it! I'll leave it at that for now! Exciting!! The Naked Basics palette is amazing isn't it? !